The daughter of a Russian cellist, Irina Kulikova started developing her musical senses at an exceptionally young age. At five, she got her first guitar. At eight, she made her first public performance. By the time she was twelve, Irina Kulikova was a child star playing all across Russia and at festivals in Europe, to be discovered by some of the world’s leading guitarists and critics. At fourteen her name appeared in Maurice Summerfield’s book The Classical Guitar, its evolution, players and personalities since 1800. Today, Irina Kulikova tours far afield, with appearances at leading festivals in Europe, North America and Asia and in concert halls such as the Amsterdam Concertgebouw, the Tchaikovsky Hall in Moscow, the Academic Capella in St. Petersburg, Schloss Mirabell in Salzburg, the Palau de la Musica in Valencia, the Musashino Hall in Tokyo and the Oriental Arts Center in Shanghai. 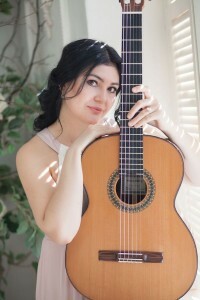 She received over 30 awards for her artistry, including 1st prizes at the highly prestigious competitions of Michele Pittaluga in Italy, Guitarra Alhambra in Spain, Forum Gitarre Wien in Austria and Iserlohn in Germany.Irina Kulikova graduated with distinction at the Mozarteum University in Salzburg (Austria), the Conservatoire of Maastricht (The Netherlands) and the Gnessins Academy in Moscow (Russia). She recorded four solo CD’s, three of which are distributed worldwide by the Naxos label. Irina Kulikova resides in The Hague (The Netherlands), Los Angeles (USA) and Salzburg (Austria). Her concert career as a soloist and with a variety of ensembles and orchestras, she combines with a personal dedication to teaching.